Apple is releasing the first public beta of OS X 10.11, El Capitan. Jason Snell takes us on a tour. Apple announced OS X 10.11 El Capitan at its annual Worldwide Developer Conference, due to ship in the fall but with a public beta release to follow this summer. If you’re just too excited about El Capitan to wait for fall, your chance to try out the next generation of OS X is coming this morning. 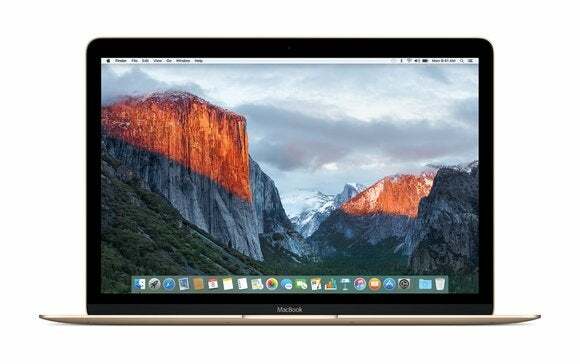 Today, Apple will release the first El Capitan beta to users who have joined its public beta program. Here’s a first look at what to expect from the Public Beta, keeping in mind that El Capitan is still a work in progress and a lot can (and will) change between now and the release of the full, finished version in the fall. When an OS X update arrives, it’s also time for the annual upgrade to the Apple-built apps that are included with OS X. 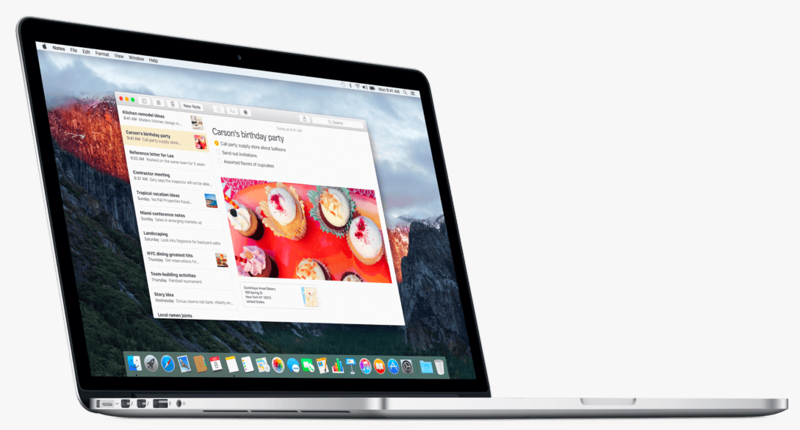 With El Capitan, Apple Mail is getting a big update. Some of the changes are more cosmetic in nature. 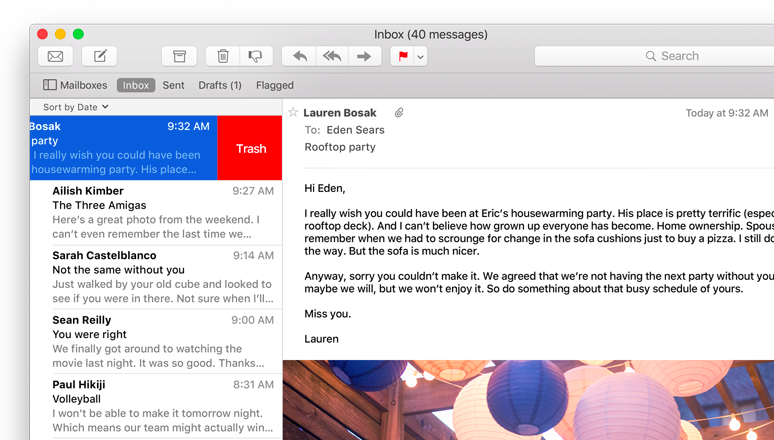 Taking a cue from iOS and from some third-party competitors, Mail now allows you to use the trackpad to swipe messages into the trash or to mark them as unread. Trackpad-oriented users will appreciate the shortcut, though I found myself wishing for a few more options–such as being able to swipe to archive a message rather than delete it, or to swipe to flag a message. In iOS, you get to customize what happens when you swipe left or right on a message in Mail (archive, flag, delete, mark as unread, etc.). 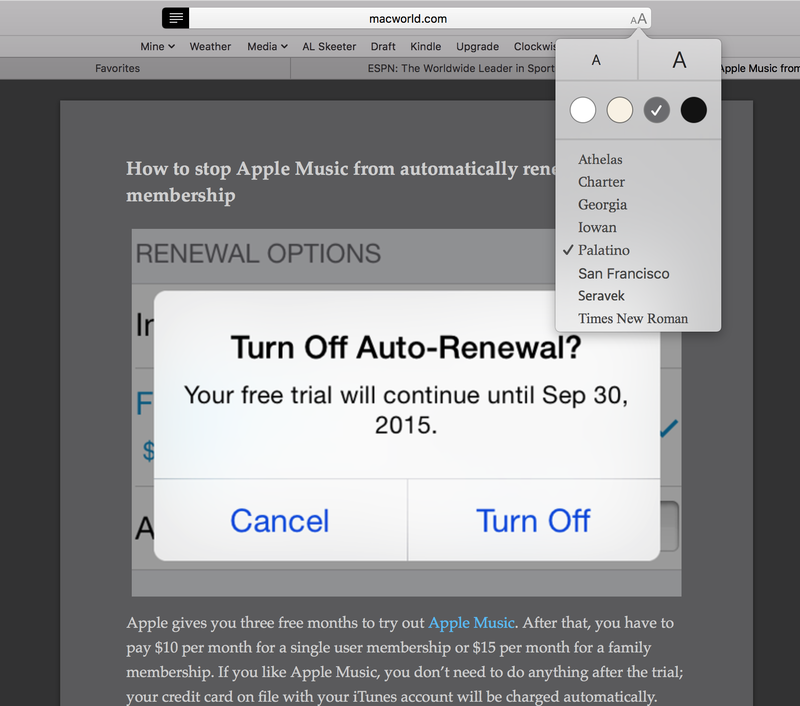 Here’s hoping Apple adds similar options to El Capitan. For quite some time now, OS X has had the ability to detect certain kinds of content in your email messages–names of contacts, events, dates and times. 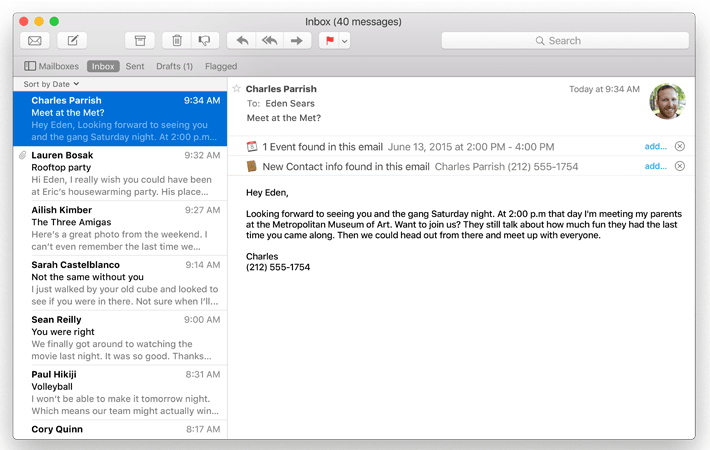 In El Capitan, Mail does a much better job of putting that information in context. If a potential event is mentioned in the text of an email message–“let’s have lunch on Thursday”–Mail will add a banner above the top of the message body that displays the event and provides an “add event” link to quickly add it to your calendar. Likewise, if the person mailing you doesn’t appear in your Contacts list, Mail will display a banner indicating that it’s detected a possible new contact with a quick “add contact” link. Mail could already add events to your Calendar or people to your Contacts list. Now it’s just more obvious which messages have potential new contacts and events. But perhaps the best feature in Mail is one that lives under the hood and addresses a longstanding problem with the app. Perhaps because it was developed at Apple’s campus, replete with high-speed internet connections, Mail has had a major blind spot: poor performance on slow connections. Have you tried using Mail on a slow, high-latency Internet connection on, say, an airplane? All you want to do is check your Inbox, and Mail’s trying to sync all your IMAP mailboxes rather than getting to the good stuff. In El Capitan, Mail prioritizes showing you new mail in your Inbox and prioritizes the downloading of the messages or mailboxes that you’re currently viewing. It’s an improvement that’s been a long time coming–thanks, slow Virgin America in-flight Wi-Fi!–but it’s finally here. Only Apple knows for sure, but it seems that Mission Control is used largely by power users and not your average everyday Mac user. Still, new ways of moving and displaying windows find their way into every OS X release, so clearly someone at Apple still loves them. 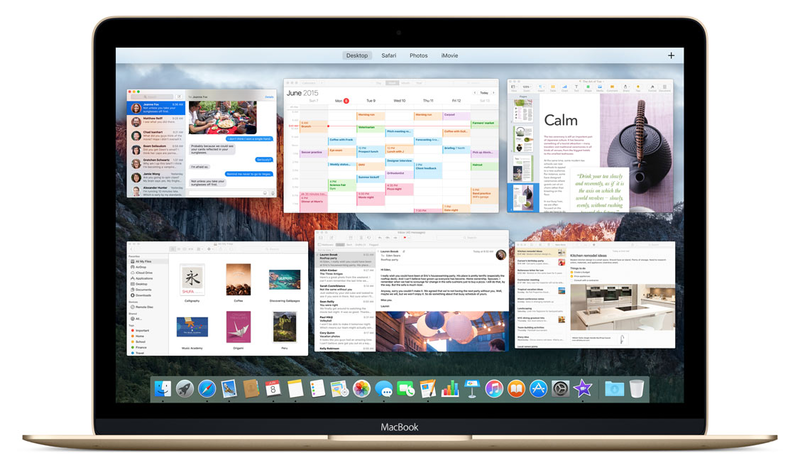 In El Capitan, Mission Control’s been revamped, with every window getting its own thumbnail–previously all windows from an App would be stacked together. All thumbnails are distributed while keeping geography in mind, so a window that’s in the bottom-left corner of the screen would have its thumbnail appear in the bottom-left corner of the Mission Control view. Someone at Apple must be using Mission Control, because it’s been tweaked again in El Cap. El Capitan’s major new feature in this category, though, is the split-screen interface. This feature echoes the new split-screen app view in iOS 9, and it adds an extra dimension of utility to full-screen view. If you’ve got a large monitor, full-screen view is often overkill, because few apps really need to take up the entire screen. 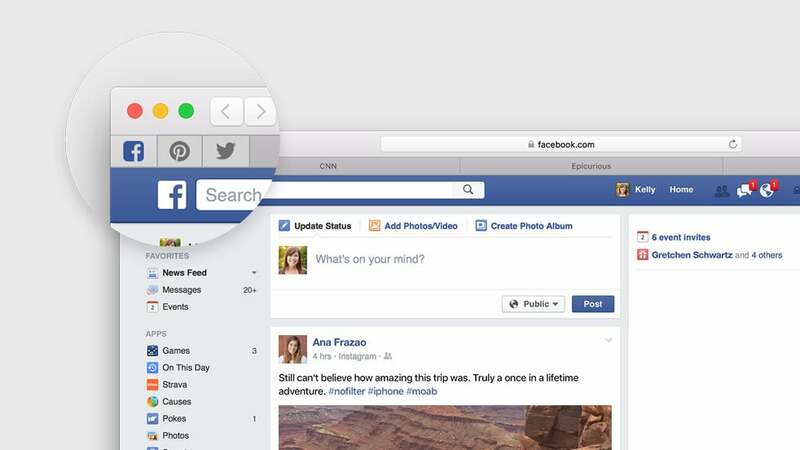 With El Capitan, you’ve got the option of having two different apps share full-screen view. Entering split-screen view is actually fun, and quite clever on Apple’s part. If you click and hold on the green plus/maximize button in a window’s title bar, you’ll be prompted to choose which side of the screen you’d like that window to be placed on. Then Mission Control will display on the other side of the screen, letting you choose a currently open window to use as the first window’s split-screen buddy. It’s fast, cool looking, and efficient. Split screen mode is cool, giving you the tidy look of a fullscreen app—only it’s two fullscreen apps! Converting full-screen mode to split-screen mode isn’t without its interface quirks. I noticed that, depending on how an app presents itself in full-screen mode, sometimes it could be very hard to tell which app was active/frontmost. That sometimes led to unexpected behavior–for example, I tried to zoom in on a PDF in Preview by spreading my thumb and index finger on the trackpad, but it didn’t work because I hadn’t clicked on the window to activate Preview yet. Since it seems that split-screen view is just a modified version of the old full-screen view, there are probably going to be some quirks like this–with apps assuming they’re the only app you can see because you’re in full-screen mode, even though they’re not–until apps get modified to adapt to the El Capitan world. Between Siri and Spotlight, Apple continues to build up its collection of searchable data sources, making one wonder when Siri and Spotlight stop being tools that use search engines and start being search engines themselves. 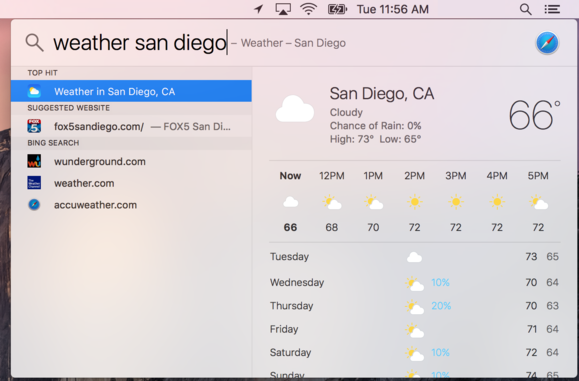 With El Capitain, Spotlight now has access to weather, stocks, sports, transit, and web video, as well as support for natural-language queries. Yes, this means you should be able to type san francisco giants standings into Spotlight and immediately be given the bad news from the National League West, or phoenix arizona weather and get the bad news from the blistering hot desert. It also means you can type queries like pdfs from june 2013 and actually get the result you’re expecting. The Spotlight window is movable, resizeable, and knows more about favorite Apple topics such as weather and stocks. I like this approach, because the fact is that many people search using natural language queries regardless of whether their search engine of choice supports it. A lot of us want to type how do I delete my Facebook account into Google, rather than carefully crafting a string of search terms. So Spotlight gets smarter, we get to be lazier, and it should all work out. With Yosemite, the Spotlight window itself came unglued from the Spotlight icon in the top-right corner of the menu bar, and floated in the middle of the screen. In El Capitan, you can actually move the Spotlight box anywhere you want, and resize the results window. To paraphrase Yogi Berra, nobody likes the Notes app–it’s too popular. The App Store is full of apps that outdo Notes at the job of taking notes, creating shopping lists, you name it. But Notes has one major thing going for it–it’s on every Mac and iPhone and iPad in existence. That’s why so many of us (and I’m including myself in this) use it. So if Notes is popular, why not give it an upgrade? That’s what Apple has done in El Capitan. Now you can stick a whole bunch of different files–PDFs, images, even videos–into a note. Notes is also now an option in the Share button, so you can send data to Notes from any app that displays a share sheet. Notes is far more robust than before, letting you drag in URLs, images, and PDFs from your Mac or the web. To create a checklist in Notes, you just select some text and click the Checklist button in the toolbar. That’s it–every line gets a little check box in front of it, and you can check them on and off at will. The checkboxes aren’t connected to anything, and clicking them doesn’t do anything except check and uncheck them. But if you’re making a quick to-do list, maybe that’s all they need to do. Up to now, Notes was one of the rare Apple cloud-connected apps on OS X that didn’t actually use the iCloud infrastructure. Instead, it connected to a special IMAP mailbox in one of your connected email accounts. (If you’ve ever searched your Gmail and seen a dozen different notes files in your results, this is why.) But starting with El Capitan, Notes can also use iCloud proper. In fact, for some of the more advanced features–including checklists–you’ll need to use iCloud. Fortunately, you can easily drag all your old notes from your email account right into iCloud, and they’ll transfer over. 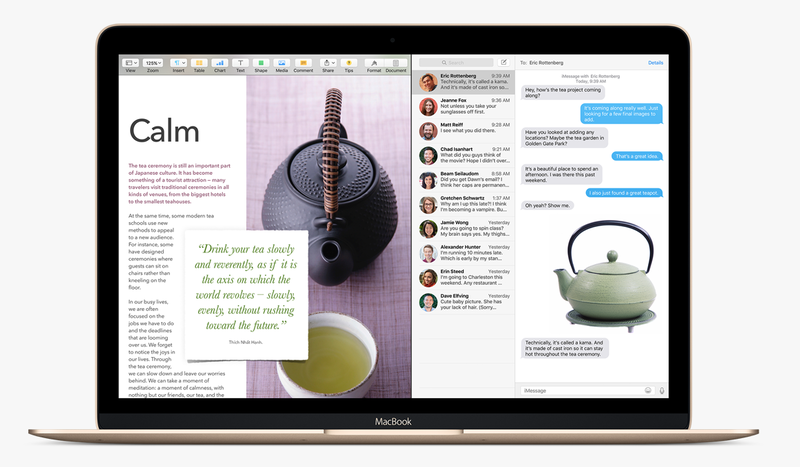 With El Capitan comes a new version of Safari, version 9, and it’s got some clever new features. I have to admit that I still use bookmarks (and don’t use RSS), and I’m looking forward to using the new Pinned Sites feature in Safari 9. Pinned Sites are like mega-bookmarks, or a simpler, more visual version of the Favorites Bar. Drag a tab into the left corner of Safari’s title bar and it will stay there permanently, with a little icon (or letter if the site in question hasn’t built a special custom icon for use with Pinned Sites) to distinguish it. Pinned sites will stay updated, and any external clicks will open in new tabs. Nobody likes blaring audio from pages that automatically play videos when the page loads, and if you’re someone who likes to open articles in multiple tabs, you can very quickly have several different videos playing in different tabs. In Safari 9, you can very quickly mute audio in all of your tabs, and can also click to inspect which tab is making the noise, so you can jump to it and mute just that tab. This is a really great feature that I look forward to using when I’m browsing ESPN, Macworld, and many other of my favorite sites, which I generally read only for the articles. Some of our favorite sites use auto-play (ahem), but it's super annoying. Safari 9 will make it even easier to find and silence an auto-playing tab. I also like the fact that Safari Reader, which gives you a simplified view of a complicated page layout, has added more display preferences. In the Yosemite version of Safari, you can make the text larger or smaller, but that’s about it. In Safari 9, you can not only adjust text size, but also choose from four color themes and eight typefaces. It’s a good look. New font choices for Reader in Safari. The first version of Photos for Mac is not without its power features, but while I was working on my book about Photos, I started to compile a list of the most requested “missing features” in Photos 1.0. 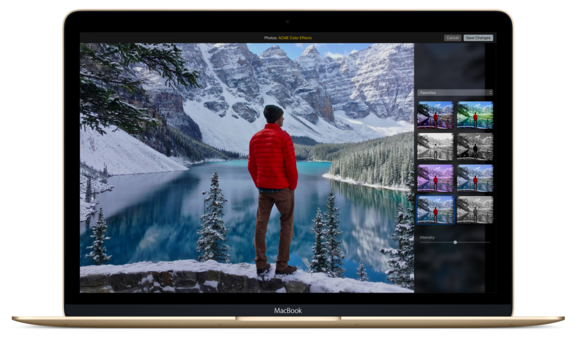 I had hoped those features would be added by Apple in a future update, and I’m happy to report that this seems to be happening with the version of Photos that will ship with El Capitan. Photos is still very 1.0 in Yosemite, but some welcome improvements are coming with El Capitan. The biggest addition is editing of image data, individually and in batches. In Photos you’ll be able to add location information to a single photo or an entire batch, batch-organize faces, and batch-change titles. Another huge user complaint was about a lack of flexibility in sorting albums. (The first version of Photos let you sort them any way you want, as long as it was by date.) The new version of Photos will let you sort them by date, title, and more. Photos will support image-editing extensions written by third-party developers. If there’s a particular editing effect or tool that isn’t available in Photos, a developer can write an extension that provides that feature, and it can be accessed from within Photos. I wasn’t able to test this feature out because, unsurprisingly, I don’t currently have access to any of those extensions.